Clearly, I can't get over my breakfast obsession. But before I even get to these yummy, Elvis-y muffins, I have to tell you about my weekend. While planning the weekend menu, it finally dawned on me what a great variety of recipes I have collected and tested. And they are all in one place, online, easily accessible in my kitchen without searching through folders full of scraps of paper. In a nutshell, I'm using my own blog as a database. I've been fretting for a while that my blog is not useful because it's not niche-y enough -- that is, it's not easy to label, elevator-pitch style. Some blogs are easy to label, as they focus solely on vegetarian recipes, vegan recipes, desserts, Indian food, gardening, canning, DIY crafts, knitting, "skinny" recipes, toddler-friendly food, Southern food ... you name the niche, there's a blog out there filling it. But my experience this weekend helped me to realize that it's OK to be a generalist because I'm filling my own niche, both for me and for you, my readers: the what's-for-dinner (or breakfast or lunch) niche, punctuated by the occasional foray into the world of DIY (gardening, pantry staples, crafts). Dare I label it? How about the "best girlfriend" niche? As in, instead of calling up your best girlfriend (or texting her, I suppose) to ask her for a dinner suggestion or how to do something, you come to The Ninj instead. Yep, that's it. I'm your best girlfriend. Your best girlfriend with a substantial database. Your best girlfriend who happens to have an awesome muffin recipe for you to try. See what an awesome girlfriend I am? 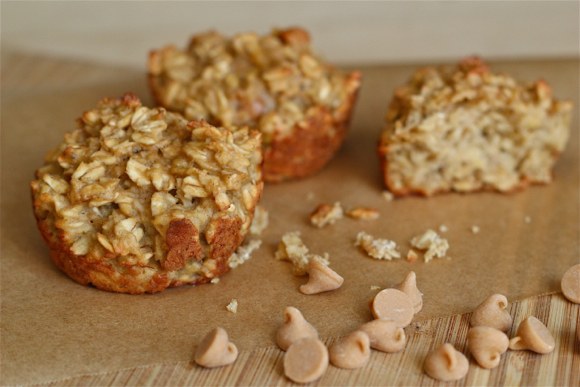 These one-bowl muffins are just sweet enough to do double duty as not only a grab-and-go breakfast but also a satisfying afternoon snack. Feel free to substitute chocolate chips for the peanut butter chips. In a large bowl, lightly beat the eggs and mash in the bananas. Whisk in the peanut butter, yogurt and vanilla. Add the baking powder, sugar and oats, stirring until blended. Lastly, fold in the chips. Spoon the batter into prepared muffin tins (they don't rise much, so fill 'em right up) and bake for about 20 minutes or until golden / lightly browned. Best served warm, either from the oven or reheated just a tad in the microwave. I've felt the same way. I'm even more general than you, tossing my cats and garden into the mix. That works for me!! And those muffins look mighty tasty, too.